When Fr. Renè Astruc, S.J. was a young man growing up in France, he clearly knew he had a religious vocation—not to a particular order, but to a people, the Native people of Alaska. Through discernment, Fr. Astruc came to understand that his vocation lay with the Jesuits, and from the time he was Fr. Renè Astruc 50 years ago ordained to now, as he faces his death, Fr. Astruc continues to minister to Alaskan Natives. 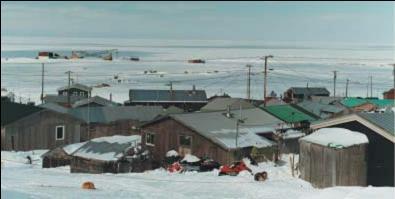 Scammon Bay is a community of 450 people, with a Catholic church, a Covenant church, three stores, a school, a post office, a health clinic, a village gym and government offices. All over the Yukon-Kuskokwim Delta where Fr. Astruc has served for 50 years, when Native people see another Jesuit—in a village, on an airplane, in an airport, at the Native health care center in Bethel—they ask about Fr. Renè. When Fr. Renè came to Alaska he followed in the footsteps of a great tradition of French missionary Jesuits, men whose hearts were on fire with the love of the Lord, who had an eagerness to share His love and His grace with people who had never heard of Him. Fr. Astruc is the last in Alaska of that particular long black line. ... death is ... the most natural thing to do and there really is nothing to fear. In June of 2001, Fr. Astruc learned he had kidney cancer. The news was devastating. But after an evening spent in prayer with his superior, Fr. Mark Hoelsken, Fr. Renè says he was granted the grace to move forward and has not been afraid since. Fr. Renè went to Spokane for treatment, then in the fall, when he was cleared for travel, he headed back to his beloved Yukon- Kuskokwim Delta. Due to rapidly declining health, however, Fr. Renè was unable to journey farther than Anchorage, and a deathwatch began at his hospital room. Hearing that he was dying, so many people came to pay their respects that a special waiting room had to be set up. Jesuits who had worked with him in Alaska over the years picked up the phone, and through their tears, told him how much they would miss him when he was gone. But then, he didn’t go. He didn’t die. The doctors expected Fr. Renè to pass on. The attending physician said a sad goodbye before leaving on a scheduled trip. Certainly the Jesuits who had bought food for his wake and discussed procuring a coffin had anticipated his death. But Fr. Renè just didn’t think it was his time yet. And, for whatever reason, his one remaining kidney began to work again. What Fr. Renè brought to the people who visited him in the fall, and still brings to those who come see him now, is peace. A quiet but steady sense that death is just fine, that it’s the most natural thing to do, and that there really is nothing to fear. As a priest for 51 years, Fr. Renè anointed many souls on their way to God. He’s sat with grieving families and he’s learned something about death: “I don’t think we need to say much—just be there and respect the moment. It’s a time they have to go through, and we help as much as we can. What is more important is to attend to the witnesses of the event. The person who is dying, in most cases, is at peace with themselves.” And how does one best attend to the family? So far, Fr. Renè has been mostly free of pain, and to talk with him one gets the impression that dying isn’t such a bad thing: He’s thinner now and he doesn’t have his usual appetite or strength, but he reads novels, history, and spiritual journals; prays and celebrates Mass; listens to music, and laughs with friends. Editor’s Note: As Northwest Jesuit went to print, Fr. Renè suffered a relapse. The cancer spread to his bones, and Fr. Renè was placed in hospice care. Jesuit Archives, Gonzaga Univ. Jesuit Archives, Gonzaga Univ. Fr. Renè at a convalescent center in Anchorage. He enjoys people wherever he is.